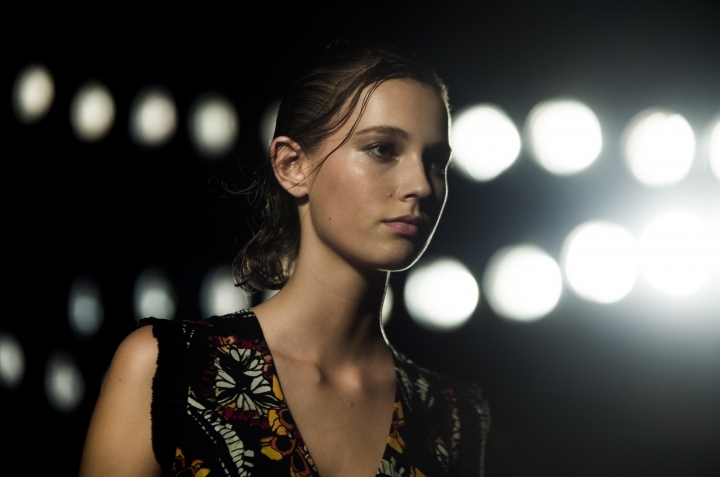 It's often remarked that New York Fashion Week feels like a carnival. Hilfiger decided to take that idea to its most literal conclusion, erecting a real-life carnival on a pier at Manhattan's South Street Seaport to display his wares. 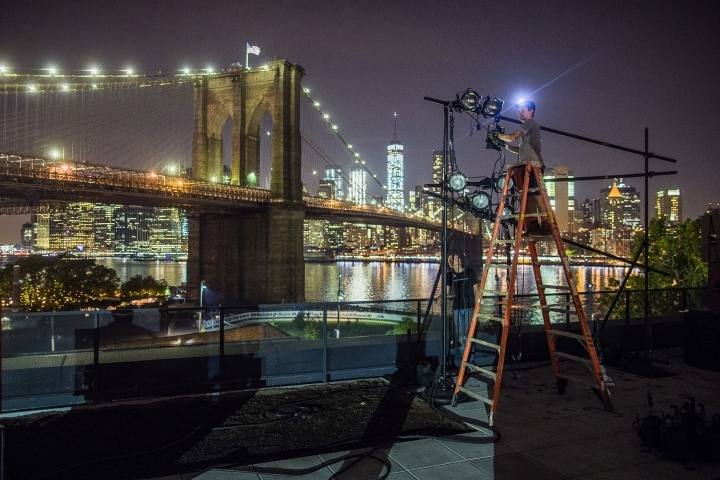 On a muggy summer Friday night, under a gaggle of strung-up lights and against a stunning city backdrop, Hilfiger displayed designs from his Fall 2016 collection — available online the minute they hit the runway — as well as his TommyXGigi collection, designed in collaboration with supermodel Gigi Hadid. But there was a lot more than clothes to capture the attention. Just steps off the runway, one could get a temporary tattoo or some nail art. There were arcade games, a 40-foot Ferris Wheel along with other fairground rides, and food — lobster rolls, hot dogs, mozzarella sticks, cotton candy. Oh, and there was Taylor Swift. The singer was there to cheer on her good friend Hadid, and cheer she did, also singing and bopping to the music as models strutted, and grasping Hadid's hand as she walked down the runway at the end with Hilfiger. Also on hand: Kris Jenner, just one of many Kardashian family members taking part in this Fashion Week. In an interview earlier in the day, Hilfiger, who's known for his lavishly staged productions every Fashion Week, explained that this one would be not only bigger, but different. "It's going to be a multimedia extravaganza, breaking all the rules and being disruptive in the fashion business," he said. "It's sort of a revolution in the fashion industry to create an event that is really not a traditional runway show and it is all about 'buy now, wear now,' designed by a model for a designer." Hadid, 21, who both opened and closed the show, said she hopes to continue designing. Her experience with Hilfiger, she said, "gave me the opportunity to learn so much from them, and kind of get my feet wet and then I can go execute it myself." Asked if Hilfiger was part of her and Swift's famous "squad" of friends, Hadid replied: "Tommy's the captain of the squad!" Replied Hilfiger, laughing: "No, I'm the godfather." The TommyXGigi garments had a heavily nautical theme, including fisherman-style sweaters, denim sailor pants and shorts, anchor motifs, and leather "nautical boots." Hadid opened the show in a sleek cotton jacket and black leather motorcycle pants, with a printed scarf around her neck — all from her collection. She closed the show in Hilfiger's cropped hoodie and basketball dress. The event, dubbed #TOMMYNOW, did not end with the runway show. Guests were encouraged to sample the rides and continue munching and sipping. The whole party was scheduled to be open again to the public on Saturday for eight hours. With a fresh take on business and his first brick-and-mortar store, Thakoon Panichgul returned to the fashion week schedule after time off to rethink and rejuvenate. And what did he come up with? A limited supply of "see now, buy now" clothes in a fall collection that had him dump all his middlemen so he could put it on sale immediately at his Soho shop and on his website, Thakoon.com. But they'll only be available for a month or so. When they're gone, that's it. "It's Thakoon 2.0. I didn't show last season. I took a year off. Basically I wanted to do something energetic, something fresh," Panichgul said in an interview after the outdoor show on a terrace of a huge, redone waterfront warehouse in Brooklyn. "With the new business model, I wanted something speedier, something that feels really fast-paced because the world that we're living in is very fast-paced," he said, echoing the sentiments of other brands that have gone to fast fashion. Of the clothes, he said: "I went back to this idea of looking at the classics and twisting them." One of the standouts Thursday night was a ruffle dress in marigold with a swingy, handkerchief hemline. There was a pair of wide-leg crop twill pants in a brownish stone with huge front pockets that lent just enough detail when shown with a medium-wide belt. Panichgul, whose mother taught him how to sew, had some other, wearable standouts, including a cropped trench-style, double-breasted jacket with a layered look sewn right in. It was a shape he carried into other fabrics and prints, both of which were often layered and mixed together. A black Chantilly lace silk dress, for instance, was worn with a Merino wool sweater cape and an oversized plaid Merino wool jacket tied at the waist. 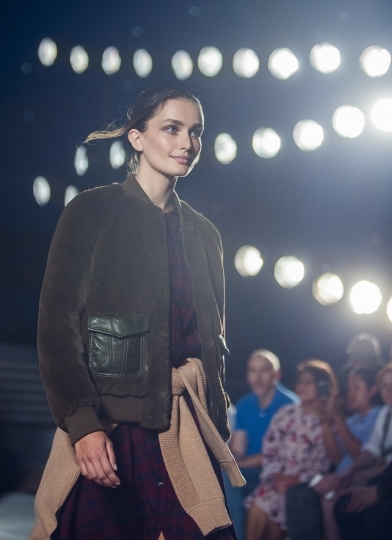 A faux mink bomber jacket was shown with a gauze plaid shirtdress and a wool sweater tied the same way. Panichgul's first store opened in Manhattan in August. Last December, Vivian Chou, the daughter of Hong Kong tycoon Silas Chou, took a majority stake in the brand he launched in 2004. "It's revitalizing," he said of his new take on fashion and business. "It gave me a lot of energy."